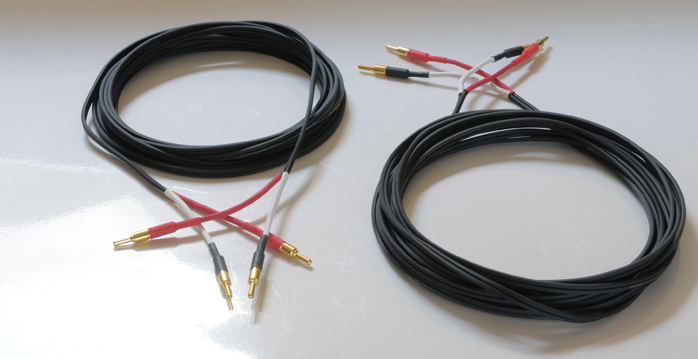 After the successful introduction of the Golden Strada #79 loudspeaker cable whose numerical index refers to gold’s atomic number, more products followed. Golden Strada #201 became a shielded interconnects in two variations of colloidal coating - pure gold or a combination of gold and silver called nano3. In the 300 Series of cables there is a choice of power cords coated either with just a gold colloid or a 80:20 gold/silver mix. As expected, various configurations of OFC copper, insulator materials and sheathing are available to choose from. The loudspeaker cable range expanded over time and not only towards more expensive variations like the Golden Strada #79 nano3 Limited and Limited Double but also downwards. SP#79 Mk2 is the currently most basic model constructed from 26 thin OFC copper threads bundled into 7 x 0.5mm Ø leads per leg and insulated with PE and PVC. The Mk4 uses the same construction but carries four leads to accommodate simple biwiring. The Golden Strada #79 Series of loudspeaker cable applies a different ratio of colloidal silver and gold. Here there are 90 gold particles to every 10 silver particles dispersed in the oil and with a higher total particle density than the first cables. The standard #79 nano3 uses 50 threads of OFC copper wires per lead. Pure copper Ohno continuous casting PE-OCC is the material of choice for the Limited Series. What all Nanotec loudspeaker cables so far had in common was a layer of Japanese rice paper surrounding the leads followed by cotton strings before the PVC sheathing was applied. This remained the recipe until the introduction of two new members of the Golden Strada series of speaker cables, today's SP#79 Special and SP#79 SR. Both are marketed at the entry level and the Special even to car audio. These are of the so-called eye-glass type with both leads running in parallel. From the outside the cables are distinguished by the fact that the Special is clad in black and the SR in red PVC. Inside things are only slightly different. The SP#79 Special uses 7 threads of OFC copper wire per leg. After being soaked in the signature Nanotec gold and silver colloidal—the same as in the top-end cables with a ratio of 90% gold to 10% silver and in the same quantity—the leads are sheathed in polyethylene before the final PVC sheath gets applied. Mr. Takeshi Hayashi sent us the wires as DIY kits which created a good opportunity to dissect the cable.